Scott Sumner is both warming up to Bernie Sanders and getting excited by growing signs of acceptance for Market Monetarism. In the UK we seem to be getting both things in the one package. Writing in the Financial Times our new, “hard-left socialist”, senior opposition spokesman on finance, Shadow Chancellor of the Exchequer John McDonnell, has said he is interested in NGDP Targeting. McDonnell has created a group of leading, if left-leaning. macro-economists to advise him on macro-economic policy. Their first job is to lead a review of the Inflation Targeting mandate of the Bank of England. 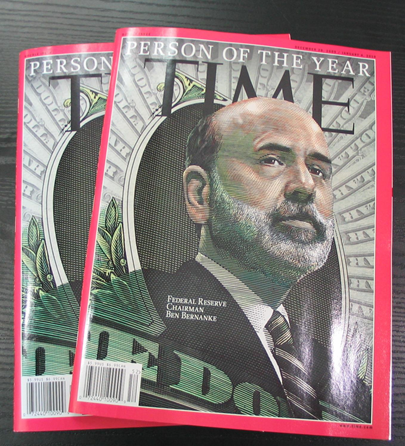 The group includes many names familiar to Market Monetarists like Adam Posen, David Blanchflower and Simon Wren-Lewis. We know them because of their willingness to debate about NGDP Targeting and even broadly accept it as at least partially useful – though they all prefer active fiscal policy at the ZLB over what they consider to be unconventional monetary policy. The diehards at the Bank of England won’t like it. An initial response from one of the leading UK economist who often represents mainstream BoE views was distinctly lukewarm. The attack on Rational Expectations is the oddest thing. It’s not clear what his problem with RE really is. It’s very hard to figure out. Yates is clearly a clever guy, but like most central bankers and their supporters, they distrust markets and prefer discretion. Yates seems to think that elite central bankers sitting around a table with lots of different models, lots of data and super-smart intuition is better than clear rules. We only need to ask how that worked out in 2008 to see what was wrong: internal politics, confusion and hopeless or downright counter-productive signalling. To recognise that central bankers were the prime cause of the recession is a step too far for the self-same central bankers and their proxies. Update. Excellent blog from Ben Southwood at the Adam Smith Institute. There are practical reasons for preferring interest rate changes (when possible) to changes in government spending as the stabilisation tool of choice, although the extent to which these are inevitable or just conditional on current institutional arrangements is an interesting question. Here I want to give an economic reason for this preference. The government could prevent waste in two ways. It could persuade consumers to hold less money and buy more goods, which we can call monetary policy. Or it could buy up all the surplus production and produce more public goods, which we could call fiscal policy. Both solutions eliminate waste, but monetary policy is preferable to fiscal policy because the public/private good mix remains optimal. 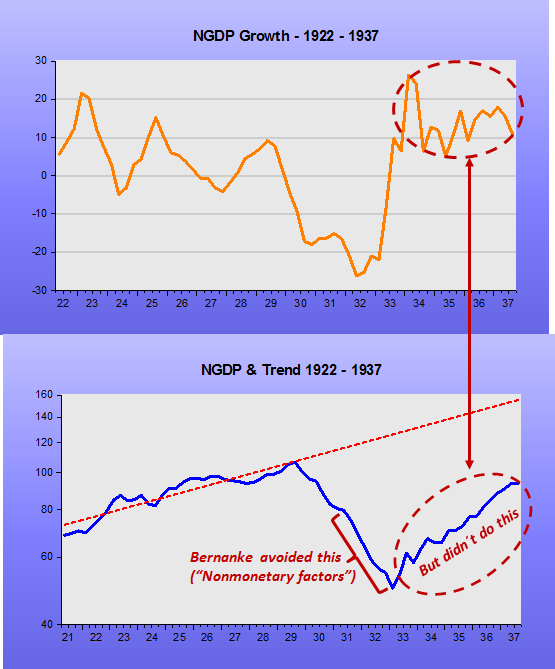 He would have naturally come to the “solution” if he freed himself from the “monetary policy=interest rate policy” constraint and thought of monetary policy as providing a stable nominal background with, for example, a nominal spending (NGDP) target. Keynesians, especially left-wing ones, are hyper-quick to attack George Osborne, the U.K. Chancellor of the Exchequer (aka the Finance Minister or Treasury Secretary) for the smallest attempts at controlling the budget deficit and howl him down whenever he is so economically illiterate to think there is the smallest problem with Britain’s 80% debt to GDP ratio. Perhaps on the day when Osborne’s deficit reduction plans went a bit astray they were all too busy cracking open the prosecco that they failed to spot significantly worrying remarks about monetary policy. Mr Osborne hinted earlier yesterday that interest rates were going to rise, clearly siding with Mark Carney, the Bank of England governor, against Andy Haldane, its chief economist, who recently suggested that rates might have to stay low for longer because of problems in the Chinese economy, or may even need to fall. Mr Osborne appeared to play down last week’s decision by the US Federal Reserve to hold rates rather than put them up, saying it had been dictated by the circumstances at the time. 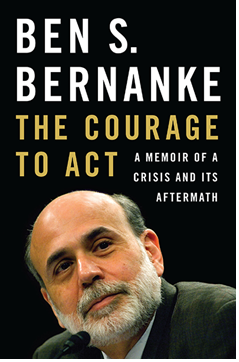 Then he added, in what was close to a departure from the traditional reluctance of chancellors to interfere with the independence of the Bank, that the signals of rate rises in recent weeks reflected the growth in the American and British economies and that the “general signal coming from the Bank and the Federal Reserve is that the exit from very loose monetary policy is going to come”. For starters, I thought this might trigger a debate about Central Bank Independence. (CBI) which has been filling then UK macro blogs like here and here since the Corbynomics debate exploded. Personally, I am CBA about CBI, the policy is the key, and often central bankers can’t be trusted to make good policy, but governments can, eg Japan. Of course, we see things often the other way around, too, but it is a sterile debate about means rather than ends. The bigger issue is why Osborne thinks monetary policy is very loose. To be fair mainstream macro and “mediamacro” (HT Simon Wren-Lewis for the term) make the common mistake all the time of confusing interest rate levels and the amount of QE with the stance of monetary policy. 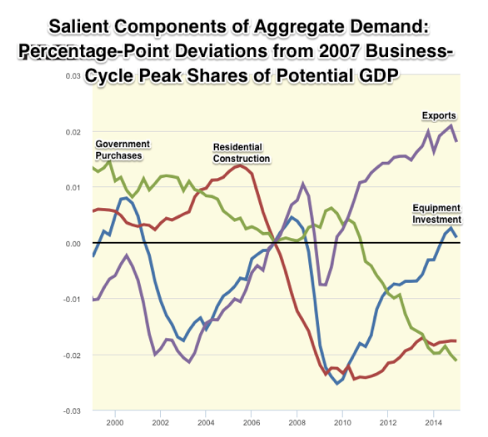 The stance of monetary policy can only be measured by looking at whether demand for money is outstripping supply of money, and that can only be seen by looking at where nominal growth (aka Aggregate Demand) is headed. If on a downward trend money is tight, if on an upward trend money is loose. 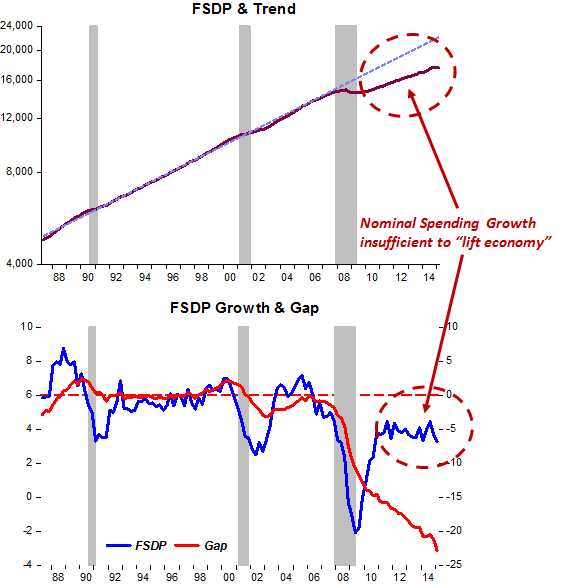 If in trend monetary policy is just right. 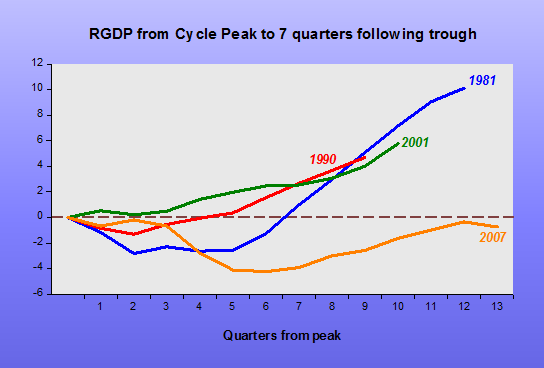 The recent historical economic evidence is that UK NGDP is slowing down, 2Q15 was quite poor. 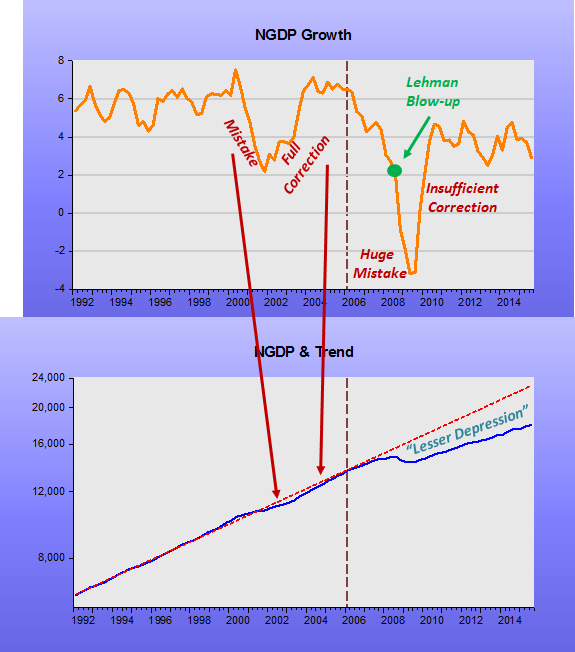 The relevant inflation rate for macro policy, the GDP Deflator was worse than poor. Tax revenue growth on incomes is still not great, just like the more difficult to measure wage growth itself. Looking forward, implied UK NGDP growth forecasts are weakening too, judging by market indicators like Sterling strength, long term bond yields, commodity prices and the stock market. Despite some interestingly radical thoughts from the BoE Chief Economist Andy Haldane, Governor Carney seems squarely in the Janet Yellen/Philips Curve camp of warning rates must rise soon. Hopefully, Osborne’s Treasury advisers will get him to see sense, if not things won’t turn out well. They won’t turn out disastrously as markets will force more delays in further monetary tightening. But the guidance on policy from Carney and his boss Osborne (and Yellen) will remain a mess. And the mess will, of itself, crimp NGDP growth. One small step for supply-siders, a giant leap for Wren-Lewis? “Good policy should not just look at the most likely outcome, but also at risks. At the moment there is a significant risk that we may be losing a huge amount of resources because of a tepid recovery. To cover that risk, we should cut rates now. The worst that can happen if this is done is that rates might have to rise a little more rapidly than otherwise in the future, and inflation might slightly overshoot the 2 per cent target. Inconvenient, but not very costly. Unfortunately, there is still little room for the UK to cut rates as they are obviously very close to the the ZLB, unless the MPC goes down the negative rate road. Perhaps Wren-Lewis is just paving the way for a reopening of his campaign for more big government fiscal policy – he has never proposed tax cuts as a form of fiscal policy as far as I have read. Is this because his anti-market, anti-supply side, bias blinds him? I don’t know. But this bias needs to be overcome for NGDP Targeting to be really effective. At or around the ZLB central banks have to be very clear just how far they will go with unconventional monetary policy in order to achieve their targets. 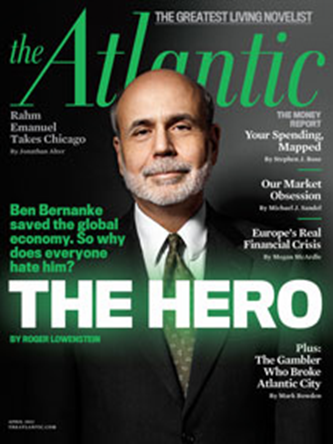 But the key issue is how the markets, and thus the wider economy, understand what the central bank is really targeting. Actual NGDP is a tricky thing to target as the numbers inevitably come out after the event, and accurately many months after the event. It could be too little, too late if central banks only look at incoming data. They must look forward, to set the flight path they want to be on. Better to work with the market and target the market’s expectations for future NGDP. At the moment these expectations can only be seen indirectly through market implied inflation rates, longer term bond yields, equity markets and exchange rates. Consensus macro forecasts are almost worthless with their constant reversion to mean, usually using the same discredited macro models used by the central bank’s themselves. Market prices are far more reliable as a guide to the future as real money is at stake rather than just the reputations of a lot of rent-a-mouths. 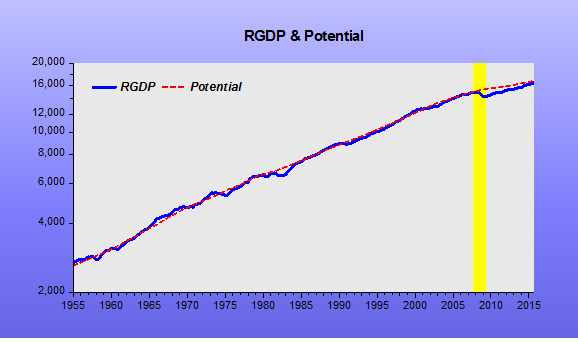 It would be best for central banks to help launch an NGDP Futures market as Scott Sumner has argued. This small but imaginative step by a supply-side macroeconomist brought together Friedman’s classic monetarism with the new insights of rational expectations. It would be even greater if Wren-Lewis too could make this step and work with rational expectations to achieve successful monetary policy and growth, rather than being so skeptical about the market all the time. For a Keynesian like Wren-Lewis this would be a giant leap, but it is a necessary one. Adrift, but with an attitude! 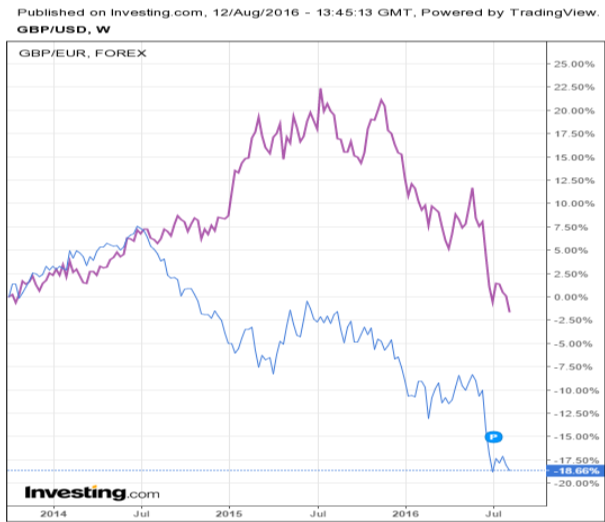 The third interpretation about why central banks are doing nothing is there is nothing they can do. Quantitative Easing seems to have come to a permanent halt either because it has stopped having a useful effect, or because policy makers fear it is having undesirable consequences. Under this interpretation the inflation target loses credibility not because the private sector no longer believes policy makers’ stated objectives, but because they no longer believe they have the means to achieve them. This possibility is the one that should really be worrying central banks right now. It is a scenario that is quite consistent with what is currently happening, and it puts at risk central bank credibility in a most fundamental way. Quite simply, central bank credibility is destroyed because people believe they have lost the ability (rather than the will) to do their job, and there is very little central banks can do to get it back because of the ZLB. This is what should be giving central banks nightmares. Strangely, however, they seem to be sleeping just fine. To “compensate” they put on an “attitude”. To show they´re “active” the Fed has elected employment/unemployment as the “informant” on the “appropriate monetary policy” (or interest rate juggling). Note that, as late as 2009, with unemployment climbing fast towards 10% and inflation – both headline and core – dropping like a stone, they mostly talked about inflation during the FOMC Meetings. Now that they are “adrift”, they scramble to get “support” from the labor market! On the basis of these and other considerations, we conclude that a conservative interim unemployment target for mid-1977 is 6 percent. Achieving this target will require a growth of output of at least 17 percent over the next two years. Of this total, more than half should be achieved in the first year, to allow the growth rate to abate as the ultimate target is approached. Taking into account the price implications of this growth path, we conclude that in the first year money income should grow at an annual rate above 15 percent. From this it is argued that even if the primary stimulus to recovery comes from fiscal policy, as seems necessary to ensure an early and vigorous revival, the money supply will have to increase for a while at a rate well above 10 percent. There is wide concern that such a sharp acceleration in the money supply would have an unfavorable effect on the rate of inflation. But we allay this concern by showing that the evidence is clearly inconsistent with any influence of money on inflation outside of its indirect effect through its contribution to the determination of aggregate demand and employment. How did things pan out? 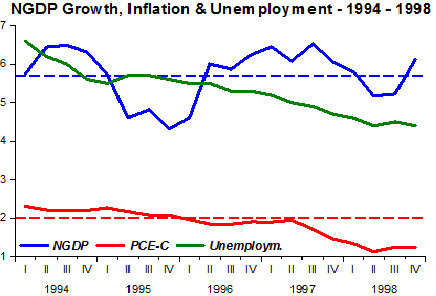 The chart below indicates that unemployment, which was above 8% when Modigliani & Papademos wrote, came down slowly, as did inflation. However, when NGDP growth accelerates, unemployment falls faster towards the 6% “target” but inflation begins to rise long before the “target” is reached. In early 2012, when the Fed introduced the 2% inflation target, unemployment was, as in 1975, above 8%. Given that inflation was sliding below the 2% target the Fed “stipulated” that 6% unemployment would indicate the time was ripe for rates to begin to rise! What´s this fixation on 6% unemployment (understood to be the NAIRU level)? Nevertheless, with unemployment falling towards “target” but with inflation continuing to drop, the Fed “reestimated” NAIRU at something between 5% and 5.5%. As of today, we are at the top of the “NAIRU band”, but inflation is still moving slowly down! 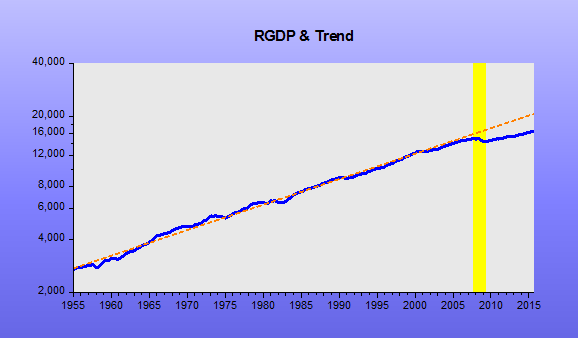 Note, importantly, that differently from the 1970s, NGDP growth has remained stable (shy of 4%), a rate of spending growth that is consistent with higher than target inflation only if trend (potential) real output growth is below 2%. By insisting on keeping the economy at a “depressed” level of activity, low trend growth may in fact become “reality” (or the “new normal”). The Fed will then feel vindicated in raising rates, while the “New Fisherians” will feel vindicated in seeing higher rates hand in hand with higher inflation! 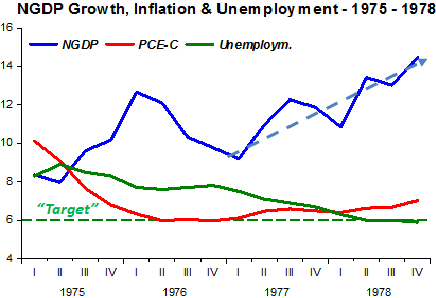 In the 1970s, “targets” for unemployment got us into inflationary troubles. 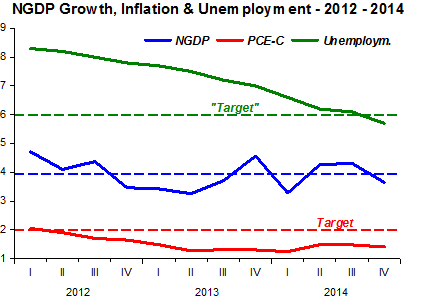 Now, “targets” for unemployment will get us into “stagnation” troubles. My good friend Benjamin Cole clearly prefers the former! I very much hope that Fed staff remembers the 1990s. 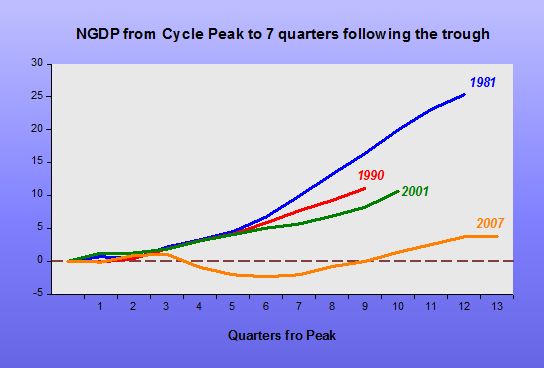 Circa 1994 it was widely believed, based on seemingly solid research, that the NAIRU was around 6 percent; but Greenspan and company decided to wait for actual evidence of rising inflation, and the result was a long run of job growth that brought unemployment below 4 percent without any kind of inflationary explosion. Suppose they had targeted the presumed NAIRU instead; they would have sacrificed trillions in foregone output, plus all the good things that come from a tight labor market. 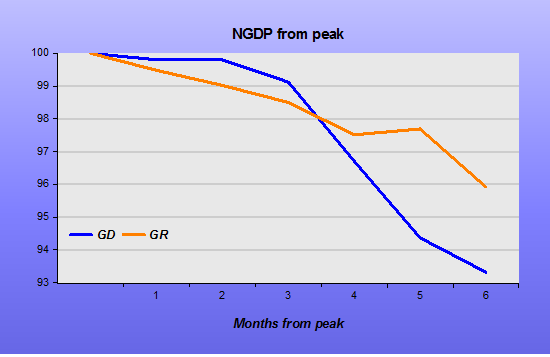 Here,also, NGDP growth is stable (not at the 4% range but at the 5.5% range). Inflation remains low and even falls (productivity shock) and the 6% NAIRU estimate was completely irrelevant!